The Weather Channel turned 36 years old May 2nd. In recognition of Independence Day, we have reduced the price to $17.76. Here Art Director Eddie (E.T.) Terrill talks about the book with a spoof of Neil Diamond’s America. Most everyone has watched The Weather Channel at some time over the years. Have you ever wondered how the channel came about and what it took to become one of the most successful and well-recognized names in cable. The Founders and doers of the early days in ‘Weather Channel Pioneers’, give you a glimpse of these wild early days when it all came together. The updated website describes the adventure with videos and excerpts. It features a spoof video by a Pioneer honoring the Pioneers here and gone. Authors of the book include the late, great John Coleman, a friend, a true visionary and a fellow crusader for good climate science and many of the original staff. 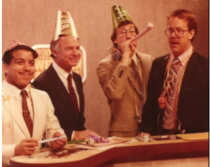 John Coleman first told me about his dream of a 24x 7 cable weather network when I was working as a vacation fill-in weather producer for his weather shows for Good Morning America in the hot summer of 1980. Like a moth to a flame I was drawn to follow him. My family and I left my home in beautiful Vermont to work with John full-time on Good Morning America (GMA) out of the WLS studio in Chicago. John was a veritable meteorological broadcaster rock star. He worked magic with chromakey green screen technology, pulling weather maps out of the air on WLS and GMA in a world mostly still using magnetic maps. He was winning awards for his on-air weather presentations. I worked with him, 2 artists and two producers all night starting before midnight to produce 4 shows. As exciting as that was, John was frustrated by the fact the time allotted for each show was never guaranteed. If the news or sports segments ran over, weather took the hit on time. Over the year, he polished up the business plan and sometimes after his last morning show would fly off to a distant city to try and sell the idea, was rejected or even laughed at, flew home, changed his clothes and came to work. The other days after the last show, we’d go to the office and talk about his weather cable idea. What would we produce and present, how many forecasters and broadcasters and artists would we need, what companies would we team with for data and technology. What doesn’t exist we will need to create to do it right. After a year of rejections though I was feeling a little like Sancho Panza following Don Quixote on his impossible dream quest. But suddenly there was interest - Dow Jones then WGN - each time the interest and our excitement spiked then faded but then Landmark Communications entered the picture - with newspapers, radio and TV stations, cable systems, they had wanted to expand into cable programming to do news when the CEO developed cancer. While they waited, Ted Turner launched CNN. After the CEO recovered, they set up new venture groups to explore alternatives. One of the members was in a poker game with John Coleman and when John told him about his weather programming idea. He brought him to Landmark, they quickly worked out a deal and we were off and running. That’s when it got crazy - we were off to Atlanta in October1981. John and I were very busy defining the product with the artists and producers. I hired two of my students to help me screen candidates for on and off camera positions. Resumes and tapes poured in during December and January. We hired many over the phone. The Pioneers reported for orientation March 1, we started practicing in April and launched May 2, 1982. At start-up, amazingly we had 58 full-time broadcasters and forecasters with a total of 66 degrees and 450 years of meteorological experience. We were state of the art for the time, but the technology was changing at a breakneck pace. It was just the start of the computer graphics revolution in broadcasting and we lead the way with more than half a dozen such graphics systems including the first in the lines of high resolution paint boxes. Our artists, who originally did some graphics or art on paper that was then captured by cameras, quickly transitioned to using pen and palette. All graphics were funneled through a unique frame storage system. The On Camera Meteorologists would load their shows and control the graphics display from the studio desk. There were no directors. In parallel our technical staff worked furiously to be able to deliver the local weather, local forecasts and all severe weather NWS messages. We developed computer units that went into every cable system that knew its location and grabbed and displayed its information in formatted pages in the Local Weather and across the bottom of the screen. For it to work, we had to get the NWS to change how they formatted their local forecasts and warnings with address coding that allowed our systems to know what was important to them and where they get displayed. When the weather was serious and it usually was somewhere in the nation, we were very serious on-air and worked very hard behind the scenes. When it was quiet, we let our hair down a little (it was the 1980s) and had some fun while still communicating information. The network in the early days was described as the first TV reality show, one of its appeals. It really was an amazing journey that can’t be told in 1000 words, which is why we wrote a book. 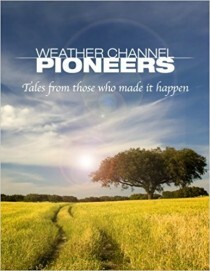 In the book, we attempted to capture more of that story, that journey from one man’s vision to a shared vision of a large team of wonderful, courageous and talented individuals that came to Atlanta from all corners of the country in many different disciplines to undertake something special and unprecedented, unique people we call the Weather Channel Pioneers. During this incredibly dynamic period, everyone went straight out, never entertaining the thought that what we wanted to do was impossible. We pulled off everyday miracles, overcame all obstacles and changed the paradigms for technology, weather data and warning delivery, graphics and on-air weather presentations. It was a time and a team like no other. In the book, the Pioneers tell that story. It is about the early days not about what has transpired over the years.